This Hinkley Avon polished chrome 3 light bathroom mirror light with opal glass shades is rated IP44 and features updated traditional style, with clean minimalist design and cast metal detailing. Please note that this wall light is not fitted with a switch. 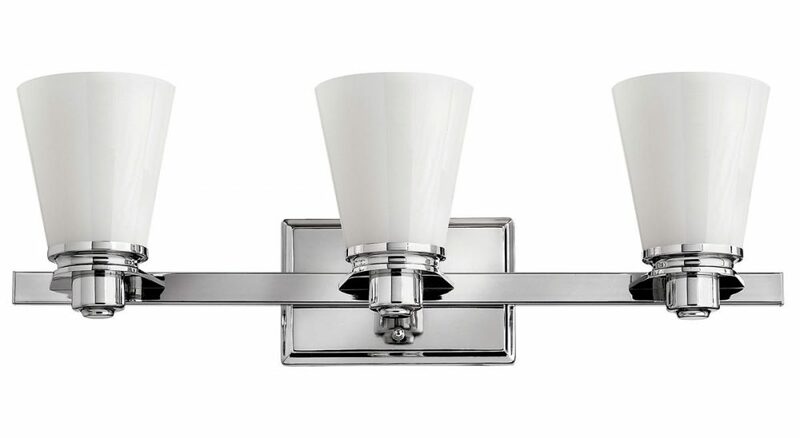 Stepped rectangular wall mount and cast arm, with polished chrome straigh bar holding three circular stepped galleries and upward facing tapered cylinder opal glass shades. The halogen capsule lamps shine through the opal glass for a softer light. Ideal for a dressing room or for use as an over mirror light. A sophisticated, stylish bathroom wall light that boasts a hint of Art Deco style and looks fantastic in period, traditional and contemporary bathrooms alike. Rated IP44 and suitable for zones 1 and 2. This elegant bathroom light is designed in the USA by Hinkley Lighting, founded in 1922 in Cleveland, Ohio. They have transformed from a small outdoor lantern company to a global brand intent on bringing you the best in style, quality and value, such as the Avon polished chrome 3 light bathroom mirror light with opal glass shades you see here. Please can you let me know if the hinkley Avon 3-light bathroom fitting can be fitted with the lamps facing down? Also, is it available with either fluted or plain glass. If not, are you aware of any similar style fittings with fluted or plain glass? Many thanks. This bathroom light can be mounted so that the shades are facing down. The glasses supplied are the only ones available for this light fitting.